HERBs CAN PREVENT AND 'AID' HORSE COLIC!!!! Horse colic prevention is critical! I have used Herbs for over 34 years and have not lost one horse to colic. Colic is the #1 killer of horses. There are many things that bring it on, and I can't say that it helps all kinds of colic, but I can say that the kinds of horse colic I have experienced is HAS helped!!! And dozens of my horse friends use it with great success too. Some are a little afraid and end up calling the vet anyway, but the only time I called the vet in a VERY bad case, the vet got lost and the horse was 100% fine by the time he finally showed. How could any vet remain skeptical? DISCLAIMER---The following statements are my PERSONAL experiences only. They are anecdotal in nature and might not work for everyone. I have had horses all my life, and have learned to see the signs of colic, or other stresses, very early on. I immediately jump into action. NOT endorsed by Shaklee Corp. at all. Sand Colic does not respond to this very well. IF, after a dose of ''colic cure'' the pain persists, and with 10 CC of Banamine it disappears, there is the possibility that Sand is the problem. There are many psyllium options at KV Vet, or at your feed store. Continue the Horse Colic Prevention with the 3 herb tablets daily. For horse colic prevention--------give 3-10 herb tabs daily in feed. Some will be picky at first, but you can start with one and work up. OR, put an entire bottle in the blender, and sprinkle a bit on the grain or other feed they like. equine senior is terrific for feeding any supplement!!!! Some love it right out of your hand!!! MOST horses with colic histories do just fine with 5 a day, but occasionally some need more. Especially important when the weather gets cold, many horses seem to colic more then, and some will colic when their feed changes. One of our miniature mares had a very bad horse colic episode a couple of days after she foaled and we worked on her for several hours before she finally returned to normal.. One of my mares, and my neighbor's stallion, get 5 every day 365 days a year. Horse colic prevention can be used lifelong. Every 4 months, I also give them 1/2 cup bran daily for one week. Horse colic prevention is the best, but we have had excellent results for horse colic 'cure'-----into a drinking glass, 2/3 full of water, add 2 drops H (makes that water wetter!!!!!!!!) and about 25-30 Herbs. I just pour the powder, about 2 heaping tablespoons, into the water/basic-h solution. Stir well. Stand higher than the horse (on a 55 gallon barrel, the back of a pickup, or something of similar height), hold their head up (I put the lead rope over my shoulder and try to have an assistant to help, but can be done alone just fine) and using a Turkey Baster (or a Dose Syringe), squirt the mixture into the back of their mouth and massage till they swallow. The reason you are up high is to facilitate the stuff going down the horse and not all over you!!! If the colic pain is especially bad, i give 10 cc. banamine (flunixin) IM along with the Herbs routine. Walk the horse for about 15-45 minutes, or until they are better. The longest I have ever had a horse stay colicy is 45 min; most are much better in 15-30 min. some say it is best to just let the horse stand and not walk, and even let them lie down..... also very helpful with some horses is to take them for a ride in the trailer. I have also had 2 experiences with major colic from horses getting into Large amounts of grain. Founder is an added serious problem (heat in the hoof walls that can cause terminal lameness). 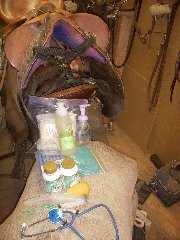 With both horses, they got the horse colic prevention routine along with a bottle of crushed calcium (helps disperse gas), given several times a day. One horse i stood in snow, the other I packed his hooves with ice (because it was summer). Both were pretty sick for over 24 hours, but had full recoveries!!!! I also gave them a couple of horse colic prevention treatments in the night. It takes a lot of work and diligence on your part (and being ever-mindful and alert to the early symptoms of horse colic), but I have personally had 100% success so far. I have saved thousands of dollars over the years, and my horses as well!!! 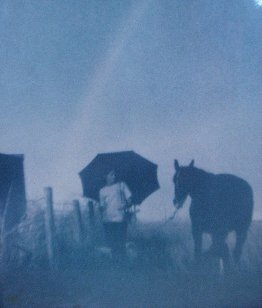 HOWEVER, I have had horses who have been colicy for a couple of days (either I was not here to observe, or the horses were out in pasture and did not come in daily), and I had the same good success with ''curing'' their horse colic as well. I'd be willing to bet that my success rate is MUCH higher than just about any vet!!! I am sure there are some forms of horse colic that don't respond to this routine, but I haven't run into them yet. If we could only get every horse owner to keep Herbs on hand, and use faithfully as a horse colic prevention as well as a 'cure,' I am sure we would see horse colic lose it's place as #1 killer!!! My acupuncture vet friend from Minn. was surprised that none of my horses had sore liver points when he first came to see them; we attribute a lot of that to the cleansing power of Herbs!!! strongid, a daily wormer that I use, is known to cause toxic reactions to the acupuncture points but I have never had any horse on herbs have sore points!! For scours-------in water, put 2 drops -H and 2 Herbs. Apply with a Turkey Baster. Repeat 2 or 3 times. Very occasionally, you may have to repeat more, but 1-3 times usually does it!!! Remember, this is not endorsed by anyone 'official,' but this horse colic prevention and ''cure'' sure has worked for me for 32+ years now!! If you would like to know about each of these amazing herbs, the cleansing herbs page has all the details!! I use an non toxic spray for fly (all bugs)!! In a pint or quart spray bottle, fill 1/5 to 1/3 with H, and the rest water, with a few drops of pennyroyal oil or citronella oil. Good for mosquitoes too! Put straight H on horse ears and dog ears and around your ears too, as well as your hair line, to keep away gnats and mosquitoes!!!!!! NO toxins to enter the body through the largest organ, the skin. H is also a fabulous WOUND & PROUD FLESH dressing…. I first heard about this from a friend whose prize Appaloosa was caught in a barbed wire fence out on a ride. They got him out, and all she had was a 4-oz bottle of H, with which she soaked the wound…..it was healing so well that they only used H the entire time. I have personally used it many times with fabulous success!!! 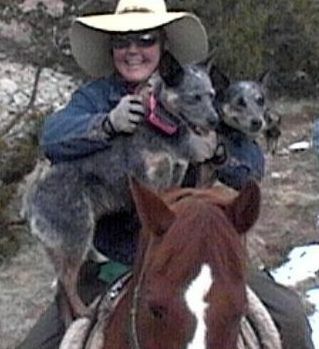 My most recent H Wound Dressing experience.....I was in Orlando at the FABULOUS Shaklee convention when Tom called to say our old mare, Pilar, had been gored in the rear end by one of the neighbor's ''visiting'' bison. He sent me a photo on email and it looked as if it did not need stitches, only lots of H applied to the wound. Be sure to visit our Buffalo Capture page, what an adventure!